The home is a 5 BR/4.5 BA beach haven with 2,920 sq ft of indoor living space and over 2,100 sq ft of outdoor living space. 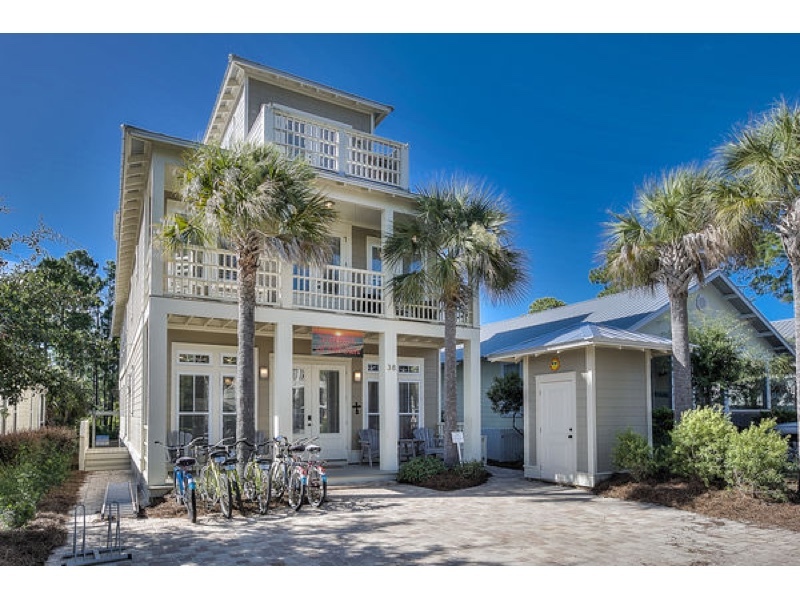 The home is one of the most luxurious & spacious homes in Seacrest Beach from screened in porches, open air balconies on all three levels of the home, to top of the line décor and furnishings. Add to that the perfect outdoor oasis. The back patio area includes a SS gas grill, a Kamado BIG Joe ceramic cooker, a 7 seat Marquis EUPHORIA Hot tub/Spa, and 2 chaise lounge chairs! Warmth of the Sun provides special areas for everyone to be together or to escape to relax and just be alone! From the covered porch entry, open the front door into to the main living space. As soon as you arrive, you will know why we call this home Warmth of the Sun with over-sized windows filtering natural sunlight throughout. In front of the house there is a covered porch with several chairs to enjoy your morning coffee or a glass of wine in the evening. The open floor plan including the living area with a 42” TV, a dining room and kitchen create the perfect atmosphere to cook, eat, relax and spend time with your loved ones all at the same time. The kitchen is fully equipped with all stainless steel appliances, including a gas stove, and all of the amenities a gourmet cook would desire. A half bath and laundry room are also located off of the main living area. Just past this space, you will find the 2nd, even larger family room with a 55” 4K Ultra HD TV. At the back of the home on the 1st floor, is a spacious King Master bedroom with En Suite Bathroom including an extra large walk-in luxury shower featuring a Moen ioDigital Vertical Spa. The ioDigital Spa provides exceptional top-to-bottom water coverage. All the shower heads feature Moen’s Immersion Technology with the ioDigital on/off control of the Ceiling Mounted Overhead Rain Shower, the Wall Mounted Shower, the 4 Wall Mounted Body Showers, and a Wall Mounted Hand Shower on a Slide Bar. The master bedroom includes: a 32” HD TV, a study desk, an EZ Boy recliner and your very own private access to the screened-in first floor porch with a modular sectional seat, swing-a-san’s, and an outdoor dining table where you can take in the natural beauty of the wooded space that sits just behind the home and with easy access to the Outdoor Kitchen, the Marquis EUPHORIA Hot tub/Spa or the chaise lounge chairs! On the 2nd floor of the home, you will find 3 more bedrooms and a quaint sitting area to read a book, listen to music or just relax. A King Master Bedroom has a 32” HD TV and a luxurious En Suite bathroom with a large whirlpool tub and a separate soothing “rain fall” shower. An additional King bedroom has a 32” HD TV and shares a hallway bathroom with the Bunk Room. The Bunk Room has a Full bed on the bottom and a Twin bed on top. On the front of the home with access from the King Master bedroom, there is another covered balcony overlooking the tranquil streets of the community. At the back of the home with access from both the King bedroom and the Bunk Room, is a spacious screened-in balcony with a 55” 4K Ultra HD TV, comfy furniture and a hanging bed to relax on and to further enjoy the Florida outdoors in good and bad weather. The 3rd floor houses a Queen bedroom with its own private uncovered balcony perfect for drinking your morning coffee or sipping wine while taking in the breathtaking views of the sunset and glimpses of the Gulf of Mexico! The 3rd floor also has a full bathroom with shower and a wet bar so that you and your family can make the most of the Florida sunshine on the home’s back covered balcony area with bar stools/tables on one side and a club chair set on the other. The balcony opens to a large 275 sq ft uncovered Sun Deck featuring 4 chaise lounge chairs and a sundial swivel daybed for your private sunning pleasure as it faces the communities 13.56 acre private green-belt/reserve. Paved private parking for vehicles. Fully equipped kitchen with all stainless steel appliances, including a gas stove, and all of the amenities a gourmet cook would desire.